A cold rainy day is a perfect day for soup made with butternut squash, carrot and sweet potato. The starchy vegetables become a velvety puree and the coconut milk adds a rich depth. This time I didn't have sweet potatoes, but I did have beets. ﻿The sweet earthy flavor of the beets didn't change the flavor much but the color is redder. What color would say that is? Persimmon? I downloaded the Sherwin Williams paint sample color matching ap and it suggests Gladiola, Coral bells, Ardent coral or Heart throb. While I don't want butternut beet soup as a wall hue, I enjoyed it as a vibrant colored soup. Start by cleaning and pealing your carrots, beets and squash and chopping them into sections less than four inches long. They just need to fit in the pot, don't worry about how big they are, you will puree them after they are cooked. 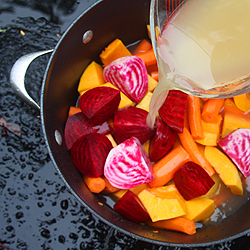 In a large pot over medium heat add the carrots, squash, beets, broth, coconut milk and bay leaves. Cover and allow it to come to a boil. Mean while, sauté the onion with a tablespoon of olive oil over medium heat. Mince the garlic and ginger. When the onions are translucent add the garlic and ginger. Sauté for an additional minute then add the onion mixture to the pot of stewing vegetables. When the soup pot starts to boil reduce the heat to a simmer. Simmer covered for 30 minutes or until the vegetables are tender. Stir occasionally. While the soup is simmering make the lime cilantro yogurt sauce. 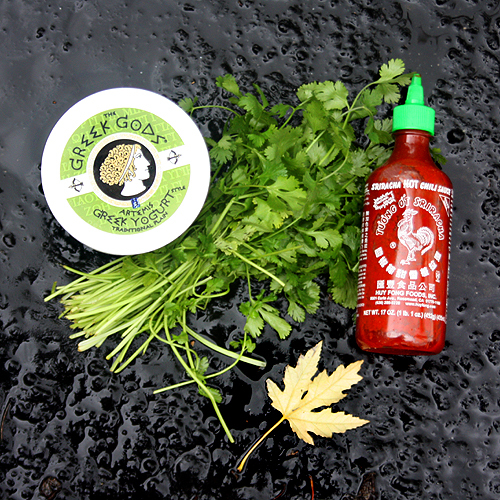 In your food processor add the juice from the two limes, yogurt, cilantro and sriracha. Puree until smooth. Pour into a small serving bowl and refrigerate until you are ready to serve the soup. When the veggies are soft you are ready to puree the soup. First remove the bay leaves. Then use an immersion blender to puree the mixture. If you don't have an immersion blender, puree the soup in batches through a blender or food processor. To serve the soup pour into bowls and top with a dollop of the yogurt sauce. You can even make a design if you want. I made a smilely face in my first bowl and then figured why not something more discriptive like a beet? No special tools needed. I used a spoon and a chopstick. Just amazing! I can't wait to try this! Sounds delicious, Foy, and your photos are completely stunning. Are they all yours? Wow. Wowee. Gorgeous photos and a creative/yummy dish! Very inspiring. I so love all the ingredients in the soup. Yummy, this one is a keeper! Thanks for sharing. Thanks Jaqueline and Grubarazzi! Since it was so cloudy I didn't have enough light in the kitchen to get decient photos. I took the whole thing out onto the deck (the black background is part of tar roof). It's a trick I'll have to remember. The cloudy sky worked just like a lightbox. Foy, you are so creative. HOLY COW. I can't believe you put the soup pot on your wet driveway. Mind blown. So effective for evoking the feeling of Autumn. Your yogurt beet is fantastic! I love it! I posted my comment as you were posting yours. Tar roof then. Still awesome. Such a neat garnish. Needs to be Top 9! yum! that looks so pretty. Just had to tell you what beautiful photos these are. Brilliant! Beautiful and so creative. Just what we all need on a cool Fall evening. 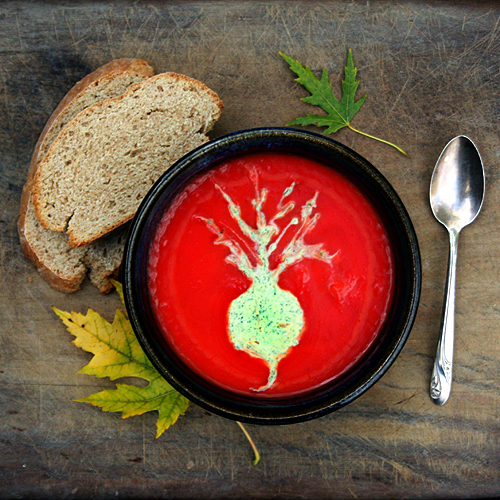 How did you make that beautiful beet design?! I would suggest doing all future shoots on the deck. These are brilliant. This is a stunning soup! That beet design just puts it over the top! Great photos too! This looks and sounds amazing! Never thought to try a beet and butternut squash combo, but I love both so I can only imagine how good they'd be together. this is an absolutely beautiful recipe. i'm sure it's incredibly delicious and the images are stunning! i love all of it! What a stunning soup and a great flavor combination! Thank you for sharing! I saw this post on Tastespotting and just had to stop over to say that I LOVE the yogurt garnish that you put on top of the soup. So creative and beautiful. Wow! First of all, this looks amazing! Secondly, I love the idea of combining butternut squash and beets...genius! I was photograzing ~ and found this. And your artwork cant be Beet. What a striking image--absolutely beautiful. I've never considered combining beets and squash in a soup. Thank you for the inspiration both to try something new and to improve my photography. lovely photo! and such a creative beet design... love it! 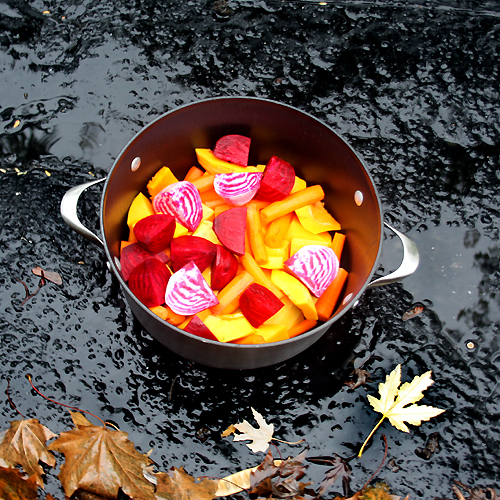 Beets and butternut squash is a perfect combination of this fall weather. I can't wait to try this, perhaps with coconut yogurt rather than dairy. Peeled! It's peeled!~ You peel the vegetables, while you listen to the peal of church bells! Beyond my usage freak out, I'm super excited to try this -- got some beets and a butternut at the farmer's market I need to use! Thanks Anonymous! I hate it when I have mispellings or grammer errors and no one tells me! Someday I'll have an editor or perhaps get better at writing :). Hey fellow RPCV! Love the sounds of the recipe, can't wait to try it! Thanks! The stunning colors of the veggies says health and this soup says,"make me." ;-) Love it! Also like your crafty use of shaping the yogurt like a beet. what would you say the number of servings are? This is a gorgeous soup. I've added it to my Thanksgiving menu. I blogged about my planned menu and included a link to this post. I think your blog is fantastic and have been reading your posts and admiring your photos for several weeks. What an amazing soup! And the color is stunning, regardless of its name. I want to have this sometime soon. It is perfect for fall. This soup is fabulous. I reduced the ginger (for my husband) and haven't yet made the topping, but may eat it all right from the pot! My Dad made this for my 35th birthday lunch today and it was fantastic. He actually served it cold and it was better than any gazpacho...a great cold soup to add to your summer menus! I didn't use the sauce part but the soup was devine. I used yellow beets,roasted garlic and added seasonings to my family's tastes. Keeping this recipe for sure!